The mission of the Highland View Church of Christ is to teach Christ and to save souls through demonstrating the love of Christ in our lives. We are intent upon strengthening our faith in Jesus by serving others daily. Our faith is demonstrated by showing God's grace at work in our lives as we claim his promise of salvation for all who accept Christ. 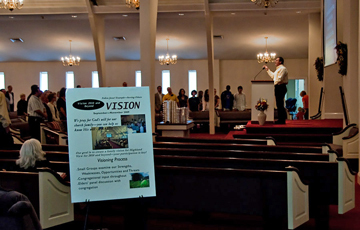 The Vision 2010 process was kicked off in the Sunday morning assembly on 9/6/2009 and concluded 11/1/2009. One of the outcomes of this process is the new tri-fold publication Vision 2010 And Beyond. See document links below. Stacy presented the report to the leadership team for discussion. Leadership team developed a 3-page summary of suggestions that became the congregational input form. At the main assembly on Sunday, September 27, Stacy distributed the congregational input form to the audience and invited responses from all interested persons, regardless of membership status. The process continued through October 11, when all input was due to the church office or to Stacy. Stacy gave out a copy of the statistical results so far at the main assembly on 10/11/2009. Small group leaders picked up copies of the summary results and distributed to groups during the week of 10/18. Groups reviewed the summary prayerfully and provided feedback on the most strongly recommended ideas, focusing on what is possible within our resources and how we should prioritize. Stacy Myers and the elders led an open dialog with the congregation during the assembly on Sunday, Nov. 1. Following the typical opening worship service and dismissal of children for Children's Bible Hour, the elders responded to 10 questions (see documents).